Aren't the doggy tees cute? We have cats, and they do get outside once in a while, but I don't think they'd ever tolerate a kitty tee. Cats have such odd personalities. 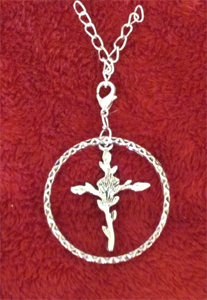 I've been wearing my oval bat pendant since I got it - the four bats against a bright cream colored moon and night sky. I sure will let you know about the skulls. Can't wait for the t-shirts either. Hopefully they will fit Shilo. He's so tiny. My cats won't wear them either. Maybe I can get them on Sassy for picture. Will have to see what kind of mood they're in. Just received skull bracelet with skull and bat earrings. The earrings are so tiny, they are so cute. The bracelet is great. Very easily adjustable. I had to take out 2 of the skulls, which are now on my HCT necklace. Whomever thought of this big congrats. Everything so far that I bought has been perfect. Glad you're pleased with your purchases Chris .. and thanks for helping us help The Painted Turtle :) More silver jewellery coming soon!! And they're here .... They're glow-in-the=dark, a two-colour swirl, and celebrate the new album! . Help TPT, support Meat and advertise the new album!! If you want to buy bands of both types, just order new ones and make a note on your Paypal form what numbers you want of each ..
eg If you wanted one of each, buy 2 new ones but tell us you want one new band and one original. We don't want to charge you 2 lots of postage, so if you do this until we've figured out how to change the system we can manage to accommodate mixed orders. Shilo my little rocker. Perfect fit for him. I'm really gad you liked them .. and that he was prepared to model them too Thanks for posting the photos! Just ordered the skull bracelot, looks great! Never too early to shop for Christmas! Oh my goodness!! How cute, Chris!! They are a perfect fit, and Shilo seems quite happy with them. He is adorable. And, I'm thrilled that you're happy with your jewelry. I didn't order earrings, but I so love my bracelet. I did take out one skull, but never thought about using it the way you used your extras - good going! If you can catch Sassy in a good mood, I'll take great pleasure in a photo. But, we do know how our cats are, don't we? Thank you again for your wonderful support of the kids served by The Painted Turtle. We at the Loafdom for the Turtle appreciate it so very much. Thank you, Juniper. I have the skull bracelet myself, and I think you're going to LOVE it! The sheer weight and quality of it is going to have you saying, "wow!" - believe me. And, we have skull rings coming out very soon. Check the site frequently if you're interested, because quantities are limited, as they are with the bracelets. Again, thank you! If you get a chance, post and let me know what you think about the bracelet, ok? And, on behalf of The Painted Turtle, will you help pass the word about the Loafdom for the Turtle by posting our link wherever you can? www.Loafdomturtle.net. We need to get the word out, far and wide. Just bought 2 of the wristbands. Thanks, Deena! You're going to love the bands. A GENERAL NOTE: Keep in mind that if you do not have a PayPal account, you can send a money order. Just check our site - the address is below. Wow, Meat posted the Loafdom for the Turtle link on Facebook!!!! "I really, truly have the best fans in the world! Thank you to everyone who helps to support my favorite charity The Painted Turtle. If you’d like to donate, please visit this web site. www.loafdomturtle.net"
Congrats on running a great program. I'm checking my box everyday for the bracelet. I'm in California, are they shipped from Australia? Anywho, I'm excited. I'll wear my skulls with pride! The wristbands are shipped by one of our three distributors. Yours will be sent out from Sue in the USA and I'm sure will be with you very soon. I can't edit my post anymore but I now realise you are talking about the skull bracelets rather than the wristbands. The skull bracelets are sent from Caryl in the UK. Just to let you know, jewelry comes from the UK, and with international orders, we have to allow for a bit more than our quoted 10 day window for deliveries. I'm certain you'll receive your bracelet soon, if you haven't already, and you're going to love it. Mine has quickly become one of my favorite possessions. We have a skull necklace coming out very soon - it may be available for sale today, I haven't checked yet - and I'm going to be one of the first in line to order. Just in case you're interested in buying a wristband or two, they'd be sent by me, and I live in Pennsylvania. Unless anyone in Australia or NZ are buying, then the wristbands come from me in Perth, Australia! I sooo want to see the skull necklace; I just might be adding to my Loafdom necklace collection... So far I have pendants showcasing bats w flames, red scarf, blue moon, pink/purple moon and grayish moon. And Sue, my wristbands came in today. They look great!!!! Thank you!!! Ah, glad you like the bands, Deena. Thank YOU! You're a great friend of the Turtle. Keep in mind that you need to put them under a light bulb for maybe an hour to "charge" their glow feature, and they'll then be good-to-go. They keep their charge forever. I wear my two all the time, and never re-charge them. They just keep glowing from the light they pick up during the day, I guess. That's so cool you have all those pendants!! I have the oval bat pendant - five bats against a bright cream moon against a night sky. Hmm.....the Red Scarf tee, the Bat Attitude black tee and the Just Loafing tee. And my favorite, the skull bracelet. And, plans for lots more skull tees as gifts for Christmas (for my son and myself - ) and definitely the new skull necklace for myself. I'm sorry there's not a picture available yet. If you can picture a longish, thinish, snake chain, with three skulls free-hanging from it, you've got a mental picture. Our web-master is on vacation this week, but I'm thinking that she may post the picture which would make it available for sale if she finds a moment to do so. Otherwise, it will certainly be available next week. Just remember that the Limited Edition Jewelry, and the skull necklace falls under that category, will ship from the UK, and the delivery time will be a bit longer, but the wait will be well worth it. Good chatting with you!! Keep rocking! And, if you would continue to pass the word about the mission of the Loafdom of the Turtle, it would be so appreciated. In Meat's own words, posted by himself to his own page, The Painted Turtle is his favorite charity, and he thanks all those who support it. What better nudge to those who care about what is important to him is there than that?!! Thanks, Juniper. We're all at the mercy of the postal system, and I'm glad you're not upset. 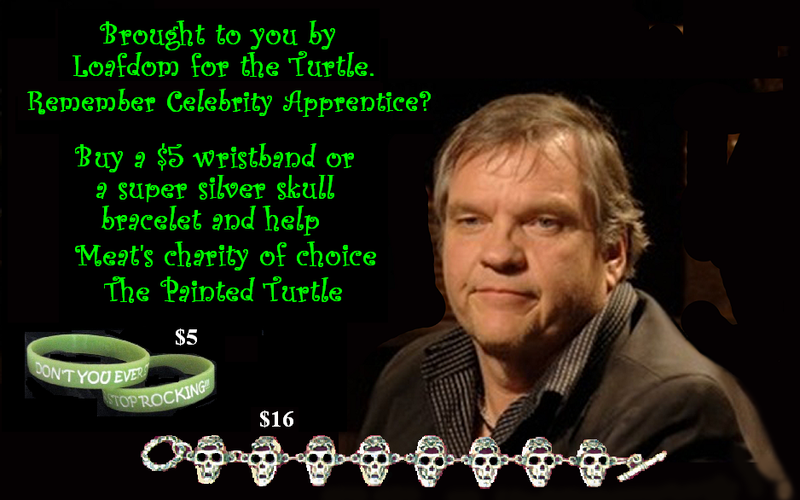 Over the past six years, music legend Meat Loaf has become a hero in the eyes of The Painted Turtle as time and time again, and often singlehandedly, he has raised hundreds of thousands of dollars to help support our organization. Through his ongoing participation in Don't Forget The Lyrics, Celebrity Blackjack, NBA Celebrity Fantasy League, Celebrity Charades, and most recently and publicly on The Celebrity Apprentice, Meat Loaf has raised enough money to send over 500 children to our summer sessions - more than half of the number of children we serve each summer! Meat Loaf's generosity goes far beyond simply writing a cheque. An asthma sufferer, Meat Loaf has visited The Painted Turtle to meet and talk with campers and their families, offering wordsof encouragement and understanding, and even laughing uproariously when a young camper (not old enoughto be a fan) called him "Meat Ball." His tireless and impassioned advocacy for The Painted Turtle, which he expresses through a host of charity events, on stage, in front of the camera, online, and through many other forums, has had a tremendous impact on the awareness of people nationally and internationally about The Painted Turtle. This was most noticable when, after his first win on The Celebrity Apprentice and his expressing such emotion far and devotion to camp, our Facebook fan base increased by over 1,000 people. Shortly after, contributions began coming to us from fans worldwide, all of whom cited Meat Loaf as the catalyst for their donations. Meat Loaf is a man who has used celebrity as a platform for good and positive change, for the opportunity to make a difference. 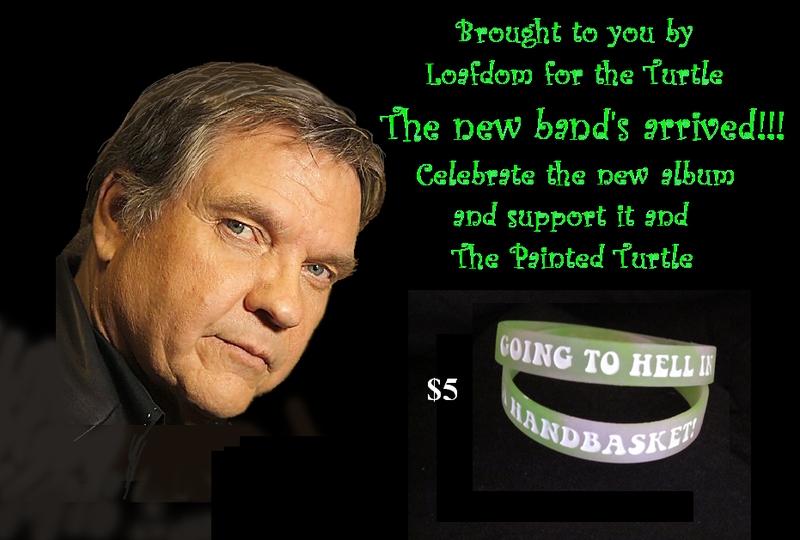 With hard work, emotion, determination, and exuberance Meat Loaf has lifted The Painted Turtle into his own personal spotlight in order to make a difference in the lives of children who are searching for a brighter day. Last edited by melon; 19 Oct 2011 at 14:45. And, just for the record, bands going anywhere other than the United States, Canada, Australia or New Zealand are shipped from the United Kingdom by Caryl. She's got the biggest zone - England and the Rest of the World - wherever that may be! Page generated in 0.08544 seconds with 14 queries.